A solid ribbon of pure brilliance encircles the wrist with this prestigious classic diamond watch by Audemars Piguet. To start, the dazzling band features closely set baguette top Wesselton diamonds, with a total weight of 53.40 carats held in 18k white gold and arranged in rows of eight to form a supple 20-millimeter width of exceptional brilliance and fire. Additional round brilliant diamonds, measuring 0.15 carats, line the top cover of the watch case for a grand total of 53.55 carats. Amazon Sells $1,000,000 Watch for 50% Off! What Exactly Does a $500K Watch Look Like? "A solid ribbon of pure brilliance encircles the wrist with this prestigious classic diamond watch. The dazzling band features closely set baguette top Wesselton diamonds, with a total weight of 53.40 carats held in 18k white gold and arranged in rows of eight to form a supple 20-millimeter width of exceptional brilliance." Christmas gift for mom? Aside from blinding yourself with $500k in diamonds every time you look at your wrist this watch is completely useless - totally unreadable. I hope she appreciates the money spent. Guys, I promise your wives will love you (and possibly be blinded) if you get this for her. You're saving half a million WITH free shipping. And so what, you have to open the bracelet and to be able to use it as a watch, but I guarantee she won't care. Perfect Gift! 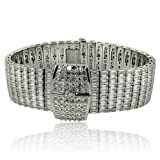 Save 50% on 18k White Gold and Diamond Watch! Amazon is selling an 18k White gold and diamond watch for 50% off -- at $500,000! Read the comments/reviews of the product. Hilarious!